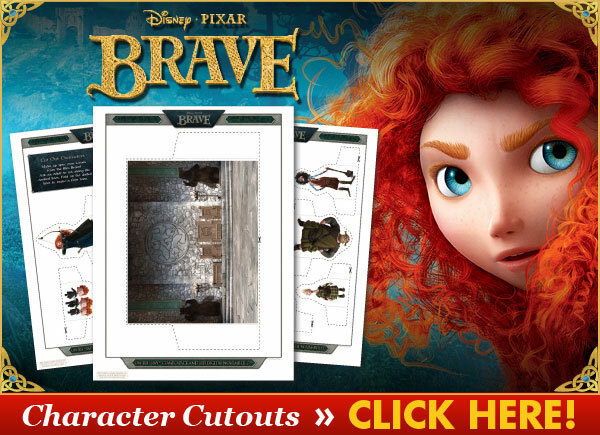 Disney Pixar Brave is one of our favorite movies of the year. The animation is just breathtaking. It is often difficult to believe that you are looking at an animated movie – it just looks so real. The Brave movie will be released on DVD on 13th November. Watch the Disney Brave trailer by playing the movie below. The story is of Princess Merida. No ordinary Princess, Merida does not want to accept that she should marry a suitor of her parent’s choosing. Merida is very much one of the new breed of Disney Princesses – she wants to control her own destiny. Of course things do not go smoothly for Merida. She runs away from the Kingdom to pursue he own fate, but along the way takes on rather more than she bargained for when she meets The Witch in the forest. She mistakenly casts a spell on her mother which will change their lives forever. There is a star studded voice cast in Pixar’s Brave. Kelly Macdonald, Julie Walters, Emma Thompson, Robbie Coltrane and Billy Connolly head all all star cast. As it is a Pixar movie John Ratzenberger is there too! To celebrate the release of this great family movie Disney Pixar have some fun downloadable activities. Click on the link below to see the downloadable character cutouts and a backdrop of the DunBroch banquet hall! We just printed them out and the kids are having a lot of fun making up their own scenes with the characters. The Disney Pixar Brave movie is released on DVD on November 13th. You can pre order yours now and they should arrive on the day they are released. The Brave (Five-Disc Ultimate Collector’s Edition: Blu-ray 3D / Blu-ray / DVD + Digital Copy) for $34.96 Shipped will have lots of extra features including the delightful Pixar short La Luna. There are lots of behind the scenes features too which show how the movie was developed and made. The Brave DVD without the extra features and Blu ray is also available for just $19.96. Whichever version of the Disney Pixar Brave movie you choose we are sure that you will be just as captivated by this movie as we were. Having now watched the Brave movie a number of times we just can’t wait for the DVD to be released so that we can watch it again and enjoy all the extra features.